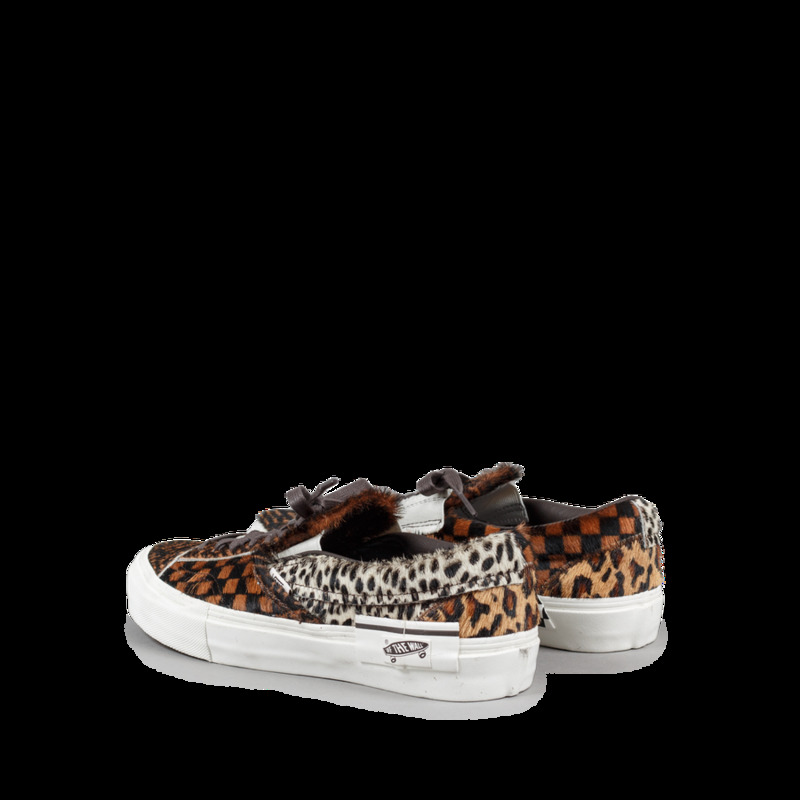 Panelled calf-hair slip-on sneakers featuring alternating graphic patterns in tones of 'caramel' brown, 'marshmallow' off-white, and black. Round toe. Lace-up detailing in brown. Elasticized gusset at sides. Rubber midsole in off-white featuring mismatched rubberized logo and check patches at sides. Treaded rubber outsole in tones of brown. Tonal stitching. On March 16, 1966, at 704 E. Broadway, in Anaheim, California, Paul Van Doren and three partners opened up their first store. The Van Doren Rubber Company was unique in that it manufactured shoes and sold them directly to the public. On that first morning, 12 customers purchased Vans deck shoes, the ones that are now known as Authentic. The funny thing is that since they didn’t actually have that many shoes they asked the costumers to come back later in the afternoon and then rushed into the factory and made each of the selected shoes. There was one little problem. When each of the 12 costumers came to pay for their newly made shoes they needed change, and since nobody on their group had retail experience they didn’t actually expect this, so they gave the costumers their shoes and asked them to come back later and pay. A lot has happened since 1966 and Vans is today one of the biggest shoe companies in the world. At Nitty Gritty we love the heritage of Vans and we believe that they certainly are as relevant today as back in 1966.